Nature fun idea No. 1 on our Countdown to Christmas list was to string popcorn and cranberry garland for the birds. This is one of those activities best done slowly. There’s no reason to rush. The fun is in sitting together, connecting and trying to see what kind of creations you can come up with. Allow anywhere from 15 minutes to much longer, depending on your child’s interest. Know your child’s comfort & safety level using a sharp needle. Assist accordingly. Use cranberries for the end knots. Consider using a thimble. The Big Explorer & I both stuck ourselves a couple of times. Stringing popcorn can be a challenge! Push the needle through the center of the popcorn – it’s the strongest part. Don’t go for a pattern; have fun with your design! Mix up the length of the strands. Smaller birds might prefer shorter strands to longer ones. This activity can easily be adapted for younger kids (like The Little Explorer). 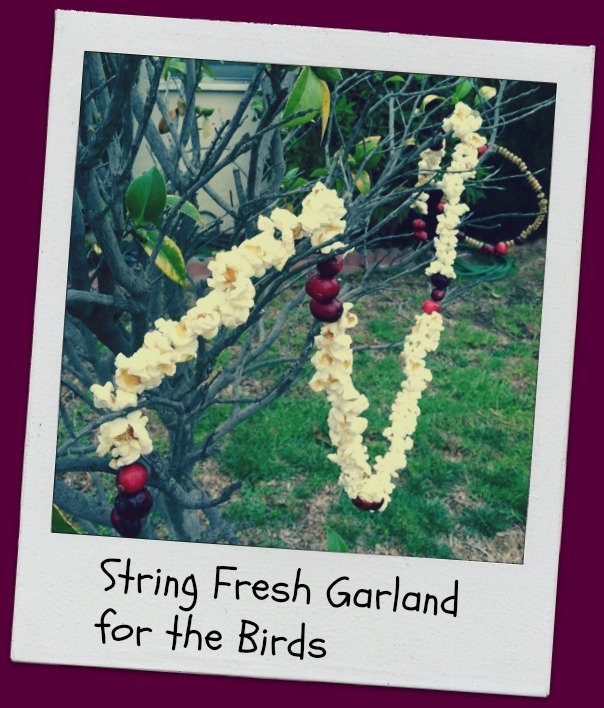 Simply skip the needle & have your child string toasted oats & cranberries on a floral wire. Is it safe to feed popcorn, toasted oats and fresh cranberries to wild birds? Many birds (including blue jays & crows) & squirrels are happy to enjoy some popcorn. 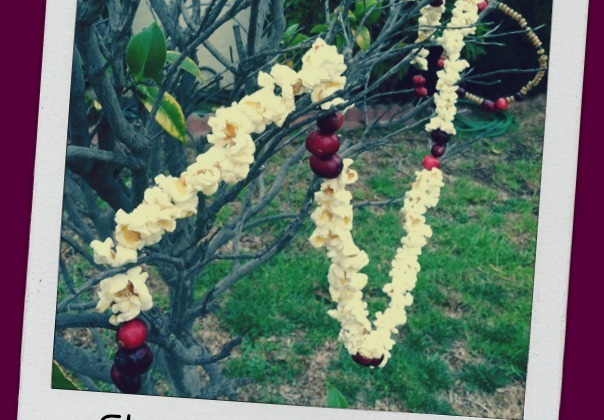 In fact, much of our popcorn was gone the morning after we hung our garland up! The cranberries are more for color than a meal; most birds have little interest in uncooked cranberries. Toasted oats are easy for younger kids to string, but might not be that popular with the wildlife. Consider adding fruit, dried apples & raisins for better luck. Tune in for more Christmas nature fun all week. This is on our list to do in the next week or so, I just need to get the needle and thread. All my needles are too small. I&#39;m surprised the birds don&#39;t like cranberries, I would have expected them to love those things! Thanks so much! Unfortunately, the rain didn&#39;t leave them pretty for long. But the birds still managed to enjoy the treat. And we had lots of fun stringing them up. My kids, especially my daughter, will love this! We&#39;ve done the pinecone bird feeders, but we&#39;ve never done a little Christmas present for the birds.